This Stuffed Acorn Squash recipe is by far my favorite. It is just a great, meatless, all-in-one dish, and it’s packed with flavor. The shape of the acorn squash makes it truly the perfect candidate for stuffing. Not only is this dish beautiful in its presentation, but it’s simple on clean up because it is a one-dish meal. Cook’s Tip: When you are roasting the squash, for a healthier option, rub coconut oil on the inside of flesh rather than butter. This will also give it a sweeter taste. I love to cook a big batch of wild rice (I do a mixture of wild and brown rice) that I can use for several different meals. I purchase mine at Whole Foods, where they sell wild rice in bulk packaging, and a wild rice mix that we really like. After I make a batch, I will use it in salads and meals for several days following. One of the things that really makes this recipe pop is the combined flavors of the goat cheese and craisins, but go with whatever you have on hand. You can certainly substitute any dried fruit, including dates or apricots. The beauty of this recipe is that you can change it up depending on what you have in your pantry and what your family likes best. When I eat this, I scrap all the sides off the squash and then eat it all together. One of the stuffed acorn squash was enough for a full meal for Bradford and me. If you feel you need more food to make a full meal, a grilled chicken breast or piece of fish would be great alongside it. Brush with melted butter or rub with coconut oil, sprinkle with salt. While the squash is cooking, combine the rice, goat cheese, pecans, craisins, oil, salt and pepper. Then divide the mixture into fourths. Place a fourth into each squash half. Return to oven for 5-10 minutes. 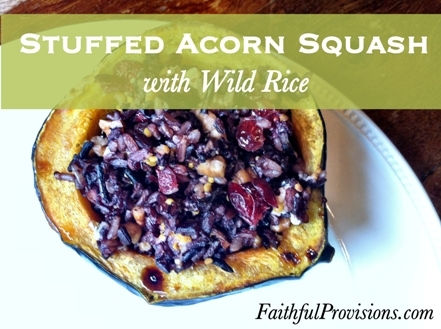 Check out this Baked Acorn Squash recipe HERE for another great vegetarian squash dish! This looks so delicious! I love Acorn Squash!